Recent rumors indicate Apple will employ a substantially glass chassis for its next-generation iPhone lineup, with most pundits chalking up the material change to aesthetics. New information from analyst Ming-Chi Kuo, however, suggests Apple is turning to a glass sandwich design to better facilitate wireless charging. In a note to investors obtained by AppleInsider on Wednesday, Kuo says he expects all 2017 iPhone models to boast wireless charging capabilities, a feature already seen on competing handsets from Samsung. According to Kuo, Apple has likely tasked supplier Pegatron to develop and produce the necessary wireless charger cable hardware. By offloading development, or a good chunk of it, to an outside electronic manufacturing firm, Apple ensures the component will undergo comprehensive testing before production. The job might also go to Hon Hai, better known as Foxconn, but the Taiwanese manufacturing giant is already under pressure to deliver Apple's anticipated top-tier OLED iPhone, Kuo says. With Foxconn resources stretched thin, Pegatron will likely be the wireless charger's sole supplier in 2017. Whether Apple plans to include a wireless charging cable in every iPhone box is unclear, but Kuo believes production will start at an introductory level next year and ramp up going into 2018. Beyond wireless charging, Pegatron is expected to win a share of OLED iPhone assembly orders in 2017. In a best case scenario, the manufacturer will supply between 5 to 10 percent of OLED iPhone orders next year, and potentially more in 2018 to offset supply risk by diversifying Apple's supply chain. 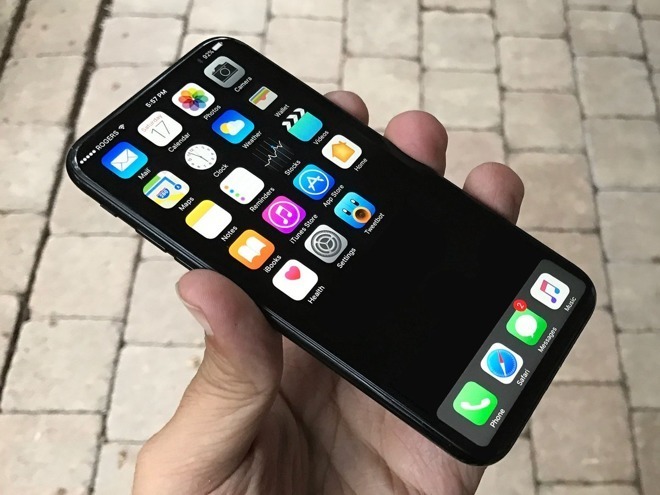 Pegatron is also anticipated to be the exclusive supplier of next year's 4.7-inch LCD model, bringing the firm's allocation of iPhone orders to 36 to 38 percent, up from 32 to 24 percent in 2016. Kuo in a separate note says he expects the next-generation iPhone to hit mass production late in the third quarter of 2017. As for sales, the analyst is upbeat on demand, estimating new iPhone shipments of 90 million to 110 million units, up from 75 million in fiscal 2016. Surprisingly, the OLED model is projected to account for 50 to 55 percent of new model shipments, while 4.7- and 5.5-inch variants using older LCD technology should make up 30 to 35 percent and 10 to 15 percent of orders, respectively. The rumor mill surrounding Apple's first OLED iPhone is already in full swing despite an expected release date at least 10 months away. Last week, Kuo predicted the OLED handset to sport a new form factor featuring a screen measuring either 5.1 or 5.2 inches on the diagonal. Due to constrained OLED panel supply, the analyst predicts Apple to market the OLED version alongside traditional 4.7- and 5.5-inch LCD offerings. Of note, the OLED variant and 5.5-inch LCD unit —but not the 4.7-inch model —will sport a dual-lens array similar to the module introduced with this year's iPhone 7 Plus, Kuo said. Many believe next year's flagship OLED iPhone is being prepped to celebrate the 10th anniversary of Apple's revolutionary smartphone. Reports, including a litany of predictions from Kuo, suggest a monolithic all-glass design that hides key features like the front-facing FaceTime camera, earpiece and Touch ID fingerprint sensor beneath a flexible OLED panel. The radical shift in aesthetics would allow for a completely seamless edge-to-edge display experience.